This crochet ribbing resembles a lot knitting ribbing knit 1, purl 1. It’s stretchy and reversible, looking great on both sides of the work; the only difference is that on the right side the ridges/arrows formed by the stitches are pointing down and on the wrong side they are pointing up as seen in the picture below. 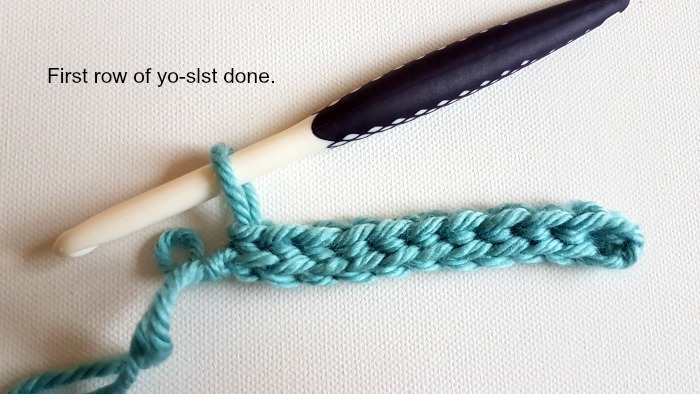 I have made a step by picture tutorial to show you how to crochet this knit look ribbing. 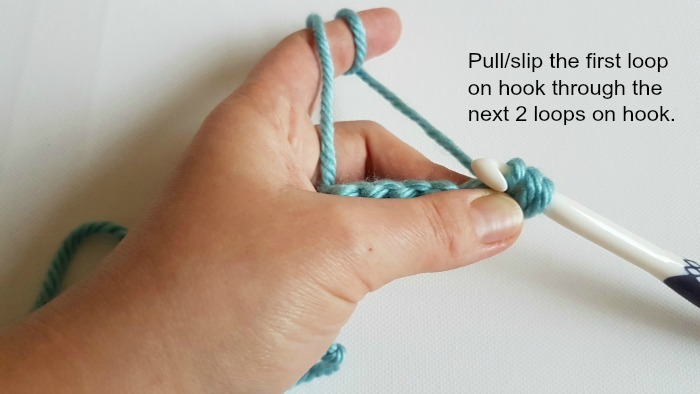 For this tutorial I have used following supplies: Red Heart Chunky Soft, colorway “Seafoam” (yarn weight: bulky 5) and a 10 mm crochet hook. - back bump of chains. See picture tutorial. Now let’s see how it works! 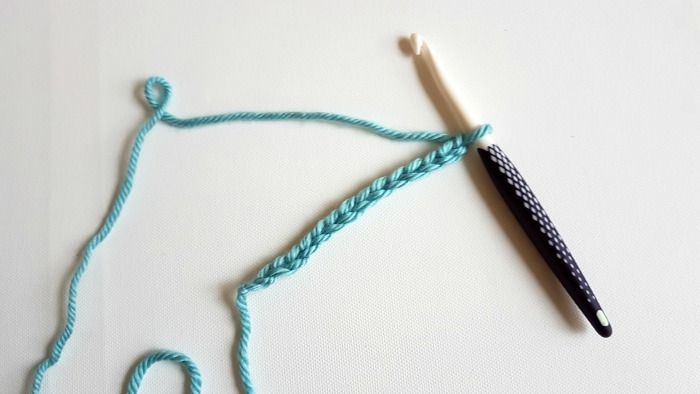 Start with a foundation chain of your desired length.Add 1 ch to turn. 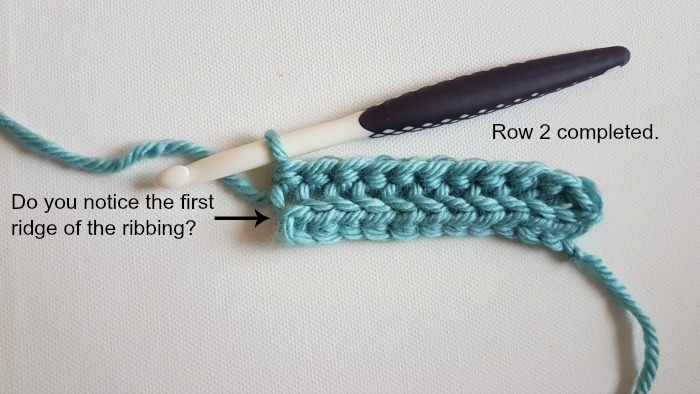 The ch1 at beg of rows will not count as a stitch! This is how the first completed row will look like! 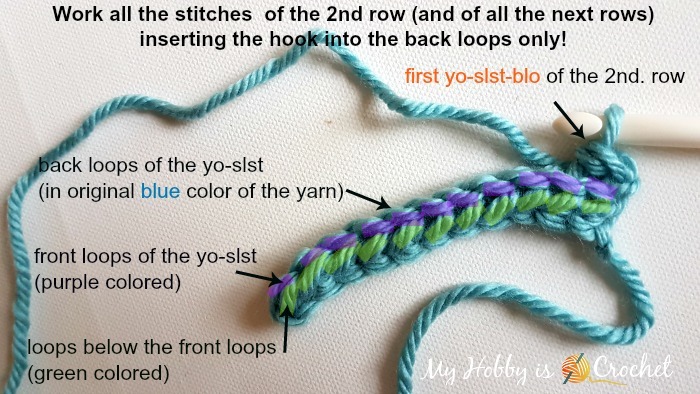 If you pay attention to the stitch, you’ll notice that there are 3 loops: two top loops (front and back loop) and a loop below the front loop as seen in the picture below (at row 2)! Important! 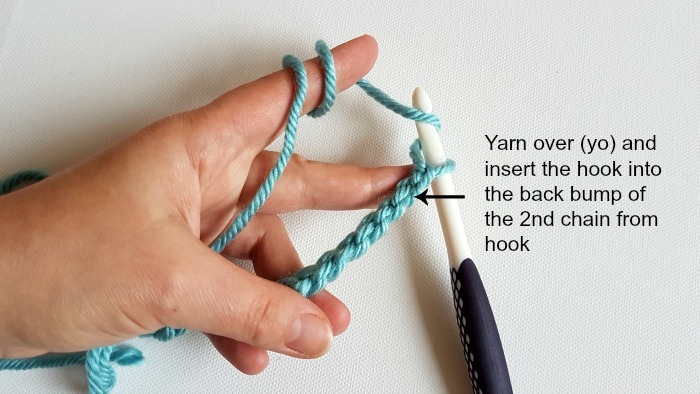 To create the ribbing pattern you’ll work all the next rows inserting the hook into the back loop only (blo) of each stitch across. 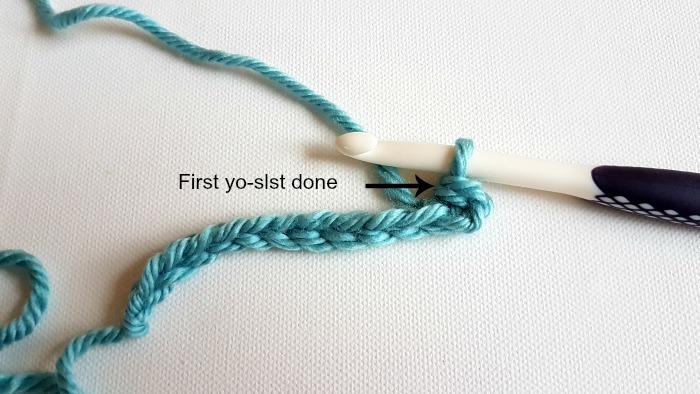 Working in back loops only,yo-slst into first st (as described at point b. above) and yo-slst-blo in each stitch across the row. Below you can see the 2nd row completed. The first ridge it's already there. Repeat as row 2 for the next rounds. 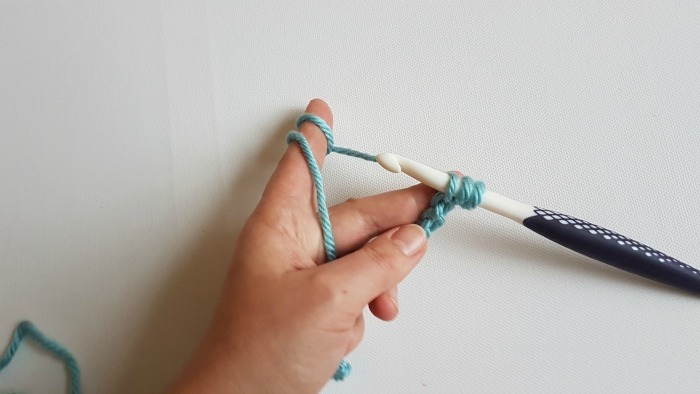 Turn your work 90 degrees clockwise and admire your knit look crochet ribbing! 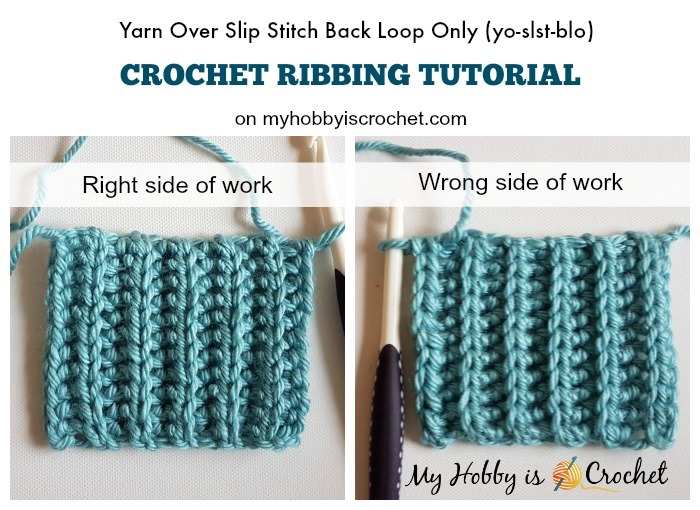 I hope that you have enjoyed my tutorial and that you'll have fun with this awesome stitch and crochet ribbing! 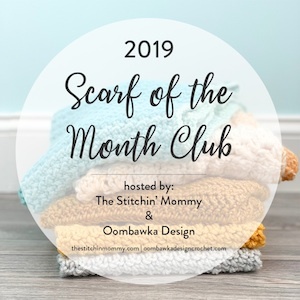 Subscribe to the Free Newsletter and follow My Hobby is Crochet on Facebook, Pinterest, Bloglovin, Google+, Instagram and Twitter. Please don't repost this tutorial to any other sites, but please share the link to this post.